GPS trackers for kids are designed to give parents or carers peace of mind about a child's whereabouts. It's not always easy to keep both eyes on active youngsters, and GPS tracking is the next-best way of keeping track of them and ensuring their safety. 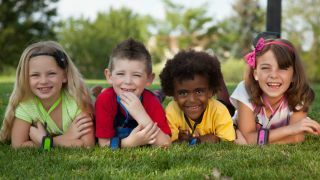 There are a number of tracking devices available that are designed with children in mind, and they generally take the form of wristband or a clip that can be attached to your child's clothing. The use GPS and other networks to track your child, and most enable you to set up geo-fenced 'safe zones'. Here's a look at eight of the best GPS-based solutions available to preorder or purchase. Tinitell enables you to track where your child is from anywhere in the world. Slot in a 2G SIM card and the Tinitell app shows you their location at all times. The SIM card also enables Tinitell to function as a wearable cell phone – your child can call you via a simple big-button interface on the device. You can set it up with 12 contacts among trusted friends and family, so your child will never feel out of touch if they're lost. The wristband is resistant to dirt and damage, with the large buttons meaning the smallest child can figure out what's going on. Designed to keep your child safe while also giving them some independence, FiLIP is a wearable wristband that works like a limited cellphone, much like Tinitell. Through the device's app, parents can send one-way text messages to their child's FiLIP, and can control who their child can call from the gadget. Especially useful is the ability to create safe zones, with the caregiver receiving a notification if their child leaves certain locations – this could be used to keep an eye on the child's school attendance, or check that they're at the local park where they're supposed to be. An emergency call button enables the child to contact the primary account holder, and FiLIP will record the call, including background noises. FiLIP is only available in the US at present. Easily placed in your child's pocket or backpack, PocketFinder is ideal for kids who don't want to wear a wristband. Parents can view their child's GPS location on Google Maps, using their smartphone, tablet, or PC. The location is updated every two minutes, and as with FiLIP you can set up geo-fenced zones, and be alerted when your child enters or leaves one of these. An emergency alert is activated by hitting the clip against a solid surface three times, with the device being rugged enough to withstand day to day use. Note that in addition to the device cost you have to subscribe to a service plan, which costs $12.95 per month in the US and $29.95 per month elsewhere. Trax Play is a small tracker that can be easily attached to a belt buckle or backpack. Parents can create geo-fenced safe zones to determine which locations children can explore; if they move outside these an alert is issued to the connected app. Each safe zone can be as small or as large as you want, with scheduling enabling you to monitor specific areas on different days. An augmented reality interface makes it simple to locate your child, with a distance indicator popping up on-screen as you pan your phone around an area. While Trax Play doesn't offer any cellphone-style capabilities, it works in 33 countries, including the USA, Canada, UK, much of Europe and Australia, without any additional fees, making it ideal for vacationers. Colorful and sturdy, the HereO GPS Watch is ideal for younger children. Its durable and water-resistant shell means it can withstand anything your youngster throws its way, while tracking their movements. Parents can check historic locations for their children, as well as their current position, with safe zones easily set up. HereO will also tell you the fastest route to the child's current location, and there's a panic button that will alert all family members to the child's whereabouts. A built-in SIM card means it'll work in over 120 countries without the need for additional purchases. Weenect Kids is a chunkier-looking device than most of the others here, but that makes it convenient for those with clumsier children. Easily attached to their clothing or backpack, the device keeps a constant eye on your child's location. If they step out of a preset safe zone, an alert notification is sent your way. Children are also able to send you an alert in case of an emergency. Weenect backs these capabilities up with a choice of three real-time tracking modes. Map, compass, and radar options ensure that you can easily track your child down if you've lost sight of them in your local park, or if they've strayed further afield. Seven-day battery life is a further boon. Working anywhere in the USA where there's a cellphone signal, KidGPS easily slips into your child's pocket or backpack, and can also clip onto a belt. The sturdy device offers on-demand location updates for your child, notifications when your child enters or leaves designated safe zones, and a panic button that they can activate at any time. At a tap of a button you can access directions to your child's current location, saving you time and effort. It's possible to track multiple children through the device's app too. This is another device that requires you to take out a service plan, and these start at $5.99 per month. A small device that's easily kept in a backpack or pocket, Loc8tor (that's the UK website, it's available in the US here) is another GPS tracker that's well suited for children who don't like wearing wristbands. Loc8tor offers accuracy to within five meters of the child's location. There are options for setting up safe zones with 'wander alerts', as well as alerts for when the child has arrived home from school safely. A panic button ensures that your child can send you an instant alert or email. A quoted battery life of 7-10 days, and the ability to work abroad, means it's ideal for families going on vacation.